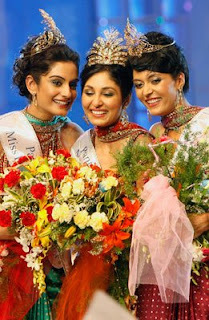 PANTALOONS FEMINA MISS INDIA 2009 COMES TO AN END WITH A GLITTERING GRAND FINALE IN MUMBAI. Pantaloons Femina Miss India Earth 2009 is Contestant No. 18, Shriya Kishore. Priyanka Chopra, Kangana Ranaut and Genelia S'souza also gave performance under the choreography of renowned choreographer Shiamak Davar (He is also giving lesson to Jaipurites in next few days), the hosts of the event are Malaika Arora Khan and R. Madhavan.